Want to make up to an extra $100 a week? Following this matched betting guide will teach you all you need to know to extract value from these popular ongoing offers. Using this technique it doesn't matter if your horse wins or loses, you can profit regardless. By selecting the most suitable horse using our horse racing software Matcha (which you can get here) you'll be maximising those profits. This is a very easy and low risk way to start playing horse racing promotions for profit. Refund if your bet doesn't offers are available from several Bookmakers. Currently Sportsbet and Crownbet offer this daily from Monday to Friday and Neds offers it once or twice a week. Typically it will be something like "Place a Fixed-Odds Win bet on and if your first bet doesn't win, you'll get your stake back as a Bonus Bet up to $25"
It's a pretty straightforward offer, either your horse wins or you gain a bonus bet. What is the Expected Value of this offer? The horse is less likely to win on selections suited to SNR (usually longer odds) therefore the bonus will trigger on more occasions which means more EV. If we treat this as a SNR bet you can see that from this calculation that if the horse wins we would profit $15.99. If the horse loses we would be down by $9.01 with a $25 bonus bet. Assuming a 70% retention on your $25 you would gain $17.50 so you would be up by $8.51 overall. 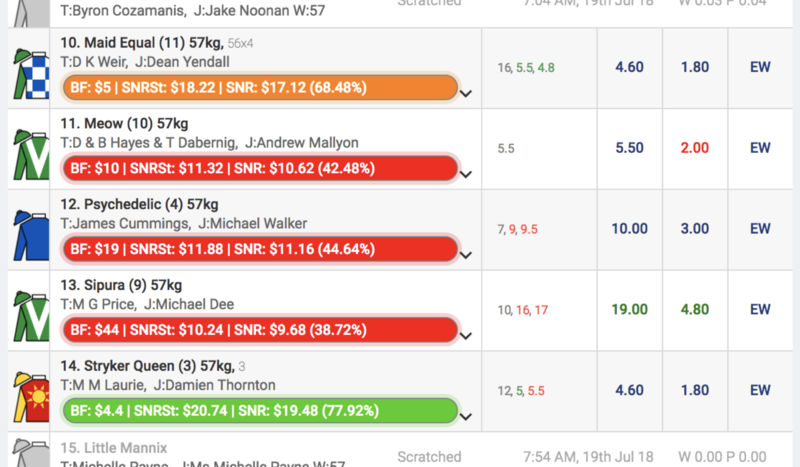 If we treat this as a SNR bet you can see that from this calculation that if the horse wins we would profit $19.78. If the horse loses we would be down by $5.22 with a $25 bonus bet. Assuming a 70% retention on your $25 you would gain $17.50 so you would be up by $12.28 overall. The longer the odds are the more difficult it is to find a close match with Betfair. Matcha will help find you the horse that has the greatest balance of long odds and odds that match closely with the lay odds of Betfair. Bonus Bet Refund If Your Bet Doesn't Win are a very easy and low risk way to start matched betting horse racing promotions for profit. While this offer is by no means complicated you do need to be comfortable backing and then laying horses at a decent speed as the most value from this offer comes in the 10 minutes leading up to the race starting. Risks are involved when placing horse racing bets. While these are minimal risks it is worth being aware of them. Laying the wrong horse. If you accidentally back a selection and then lay the incorrect horse on Betfair. Please double check the name of your horse before entering your lay bet. Your Lay Bet not getting matched. As the odds move around so quickly in the minutes before the race starts you may find that the lay bet does not get matched. We would suggest if this happens that you select 'Take SP' on Betfair and update your bet. This will mean you may not get as great a return if the horse loses but will likely only affect your profit by a couple of dollars. You may also find that the bet gets matched. We prefer this over constantly recalculating the perfectly matched lay as by the time you calculate the lay bet amount you will probably find the odds have moved again. Always place the back bet before the lay bet as bookies cut odds far more quickly and in greater amounts than the movements on Betfair. A late horse scratching can affect you in a couple of ways. Firstly if the bookie has changed the odds because of the scratching and Betfair hasn't it may appear that there are several good matches. Realistically you are unlikely to see more than one or two green matches at a time. If more are showing there may be a scratching. Also a late scratching affects the payout returned for win and losses slightly differently on Betfair and bookmakers. This difference is only likely to affect your profit by a few dollars. Applies to your first resulted Fixed-Odds Win placed on Race 1 at selected Victorian thoroughbred race meetings each weekday. Your first resulted Fixed-Odds Win Bet must lose to be eligible for the Bonus Bet. The bonus will match a member’s stake up to a maximum of a $25 Bonus Bet. Any stake greater than $25 will receive the offer maximum of a $25 Bonus Bet. Sportsbet and Crownbet are currently offering this promotion 5 days a week (mon-fri) Max $25 Bonus. Neds also offers it usually at least once a week with a max of $20. You can search for these promotions yourself by logging in and looking at the bookmakers promotions page. Any specials and offers can also be found in our Matched Betting Offer Calendar available to Bonus Money Pro members only. The next step is to find a horse lay odds on Betfair that closely matches the odds you can gain at the bookmaker. We would recommend keeping the settings to look for a match bringing a 75% bonus retention. You can do this manually but a much simpler method is to use the Matcha to find a suitable bet for you. With Matcha you simply have to wait for a horse to turn green on the bookmakers page to know you have a suitable match. If you haven't yet got Matcha - you can grab it here. You can use it on Sportsbet with a Bonus Money Free account. If using Matcha ensure you have the correct settings. You want to ensure 'Looking For' is set to 'Bonus Bet (SNR) this will enable you to find a suitable horse at longer odds while also calculating for you a lay amount that will enable you to profit regardless of the result. The lay amount is shown as SNRSt (Stake non returned stake). If you click on the green bar it will automatically copy the stake amount for you so that you can paste it in to Betfair when you lay. If your horse wins then you will have won the amount shown as SNR (Stake Non Returned) In this example you would have profited $19.48. If your horse doesn't win then you will have a qualifying loss but will have gained a bonus bet. So in the example above the qualifying loss would be $25 - 19.48 = $5.52. You will then have gained a bonus bet equal to your stake which in the example above would be $25. You can expect to convert your bonuses to cash using the matcha at at least 70% retention ($17.50). Here is a guide to converting bonus bets using the matcha. With the Bonus Money Pro service we can take anyone including you no matter your level of knowledge and show you how to add hundreds of dollars extra profit per week. This method is a slight variation on the guaranteed profit method above in that you are placing your first bet as a 'qualifier' rather than treating it as a SNR bonus bet. Ideally you would still be picking the same horses as if looking for a SNR but using the matcha in this method you are likely to pick favourites hence reducing your EV slightly. You will make a small EV saving by not having to factor in as much commission on both the bet to qualify and then converting your bonus to cash. Of the 3 methods listed on this page this method produces the greatest EV. We would only recommend using this method if you have a larger bankroll and appetite for risk. It produces the greatest EV as you are paying no commission to qualify for the bonus. So you may save around 15 cents. But for that saving you are risking $25.